This was my first Scott Sigler book, and I have to say that I am impressed. Because of a small note included in the back of the digital copy asking us readers to not to spoil anything, this review might come out sounding vaguer than I previously intended. Alive is the story of a girl named Em who wakes up in a coffin with no memories and only knows that she must find a way out. I enjoyed the story. It was gripping and at times grim. It didn’t shy away from the difficult aspects. In fact, it embraced them, but also focused more on the personal consequences of the choices and the events. Each character has to learn who they were when faced with tough choices – and I loved that. This is a story about identity. What makes the story unique in my opinion is that the identities the characters have are entirely their own. There were no outside references to help decide who they were, or what they should do and not do. They were stuck with making decision based simply on who they were without any external guidance or pre-existing framework of morals, except for a handful of memories that aren’t all that useful. It was intriguing and very unique. In the beginning, the protagonist knows nothing about herself or where she is, and she slowly begins to find out more and more as the story progresses. We join her in her journey. We know only what she knows, and so the entire picture becomes clearer for both reader and character as the story goes on. I got caught up in the action almost instantly. It was fast paced, but it worked with how the story needed to be told. Each chapter brought a new revelation or ended with another great twist. I couldn’t avoid paying attention. Within the first few chapters, the book was practically glued to my hands and I cared about what happened to the characters – I needed to know what was going to happen next. It became an untouchable itch, one that I couldn’t scratch no matter how badly I wanted to. If I scratched a little bit, it only got worse. I tried to pace myself on this, I wanted it to last longer – but, I devoured it in one sitting. If you like thrillers or anything to do with Science Fiction, you need to pick this up as soon as it hits the shelves. Sure there are dystopian fantasies out that ride the envelope of rapid-paced fascination, but I don’t think I have read anything so uniquely penned and plotted. Scott Sigler actually presents a case for plausible distant future of mankind. While leading his characters blindly through what they assume is going on, he peels back another layer that forces them to re-think, re-group and forge ahead into the unknown. What better group to do this to, than blank slates, ready to be molded into a cohesive group of allies. I will not compare this other works, because Scott Sigler deserves to stand on his own in a spotlight of fabulous and powerful creative Young Adult writing. When it comes to the characters and the setting of the novel, I can’t actually explain what I enjoyed and what I hated – everything beyond the basic synopsis of the book is a massive spoiler. I want to tell you, I want to tell you how wonderful and mind-blowing it all is – but I also want to leave the delightful discovery of the books beauty up to you. Is that ambiguous enough for you yet? I can tell you this, though. 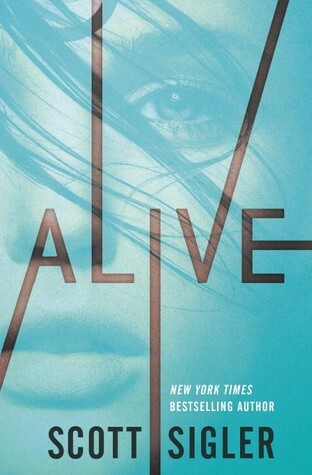 Alive explores themes such as survival, leadership, self-discovery, what makes a society a society, growing up, and religion – but all of that is just scratching the smallest surface area possible of what this book contains. My advice about reading this book? Don’t look for spoilers on social media when you get confused, don’t flip to the end of the book or read the last page. Just don’t. Don’t read reviews that talk about each and every little detail. Leave the discovery up to you; enjoy the brilliance that is Alive without ruining it for yourself. Take the obscure summary and deal with it, find out what it means on your own. You won’t regret it.